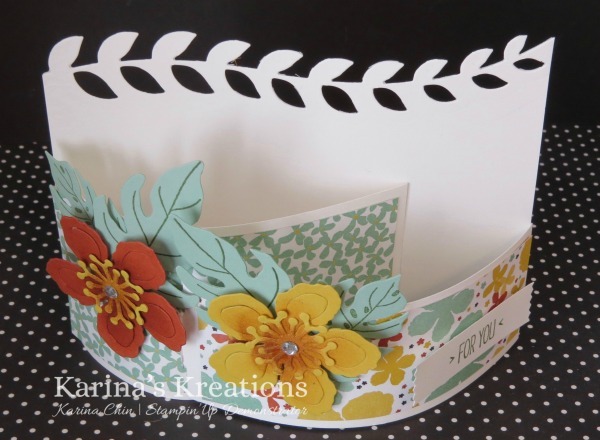 Karina's Kreations: Stampin'Up Botanical Blooms Fancy Fold Card! Stampin'Up Botanical Blooms Fancy Fold Card! We made this cute card at my class last week and I wanted to make a video showing how to make it. One of the measurements are wrong in the video however I put the right measure in a text box for you. The third panel is 1-3/4" x 5-1/2" not 1-1/2" x 5-1/2". I hope you will try one of these cards. I'm almost forgot to post the stamp it my way card challenge! The challenge this week is to stamp a card with some flowers on it and post it here!